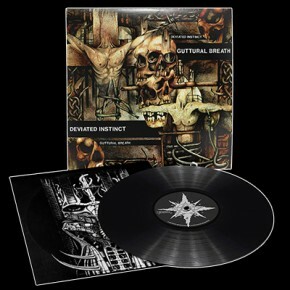 "Guttural Breath" is the second full length of the UK Crustcore legend DEVIATED INSTINCT on which they deliver ten tracks of savage and peerless Crustcore, Stenchcore. A nice rickety old punky Metal album for fans of the early Eighties style that captures a few guys in a garage hammering out crude nasty riffs. Don't let the genre tags fool you, this is a deliberately more tame release than their last one. You won't find anything resembling blistering tempos or Death Metal blastbeats here. These are slightly evil "Hard Rock" riffs and they're usually struggling to stay in time with each other. By the time this album came out they'd been far surpassed in intensity so this was simply their style choice for the album, they weren't trying to reinvent the wheel or anything. Fans of that type of clumsily low-impact evil metal should enjoy this. The original version was released in the year 1990 also on PEACEVILLE from the UK.